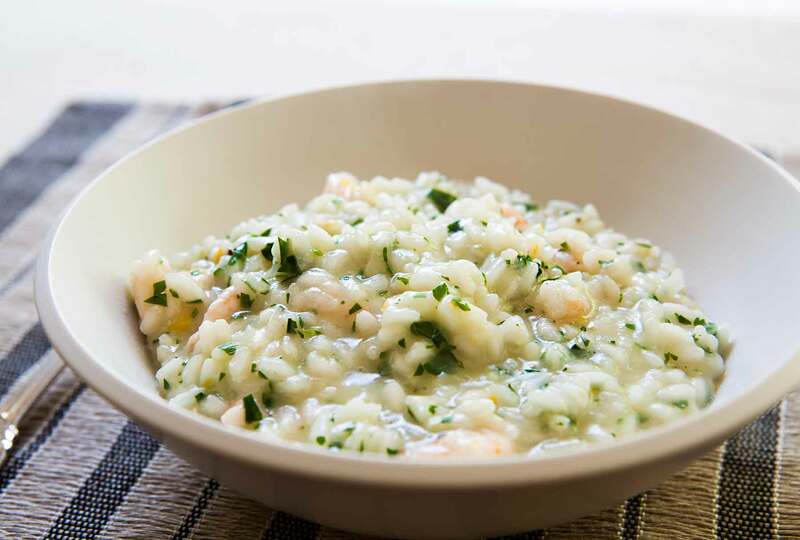 This simple shrimp risotto was inspired by a trip to Venice. It’s made with tiny pink shrimp, shallots, parsley, and lemon zest. Super creamy! You’ll think you’re in Italy! Have you ever had a food epiphany? Years ago I had a seafood risotto at a restaurant on the Grand Canal of Venice (back in the cushy days of business trips with expense accounts) that was so silky, so luscious, so creamy yet still light, I didn’t know what hit me. I ate every grain with a stunned and happy look on my face and still remember that risotto more than what was inside St. Mark’s. Although I had no idea at the time, according to my friend Hank, seafood risottos are a specialty of Venice. There they are typically served all’onda, or “wave” risotto, which means a looser and almost soupy risotto best eaten with a spoon. Hank and I spent the day cooking together and he showed me in great detail how he makes this Venetian-style shrimp risotto. My father happened by in time for lunch and ate his bowl of shrimp risotto completely, proclaiming, “Hank, I don’t like shrimp, and I don’t like rice, but I love this.” So there you have it. Use the smallest shrimp you can find. Try to find tiny pink shrimp in the supermarket’s freezer section. These “boreal” shrimp or Maine shrimp are uncommonly sweet and come pre-shelled and pre-cooked. Any shrimp you find larger than the last digit on your little finger should be cut in half. Risotto recipes require risotto rice, an Italian rice that has enough starch to help make the risotto’s creamy sauce. Arborio rice works for this purpose, but if you can get it, use a Carnaroli rice. Even better is a rice called Vialone Nano, which is more delicate and creamy than the other risotto rices and is well suited for this shrimp risotto. Love Shrimp? Try these Recipes!